Most school psychologists agree that counseling teachers, administrators, and students is an important part of their job. It often happens subtly. As part of an Individual Educational Program (IEP). Through group and individual therapy. In social skills training. 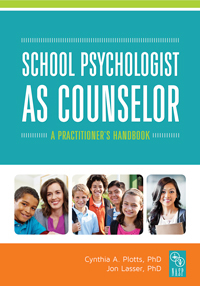 School Psychologist as Counselor guides you through your journey. Inside, discover actionable approaches to strengthen the way you serve students every day. You have the chance to impact students holistically, no matter what your role. Let this book help you upgrade your toolkit.